Well, that was interesting fun! 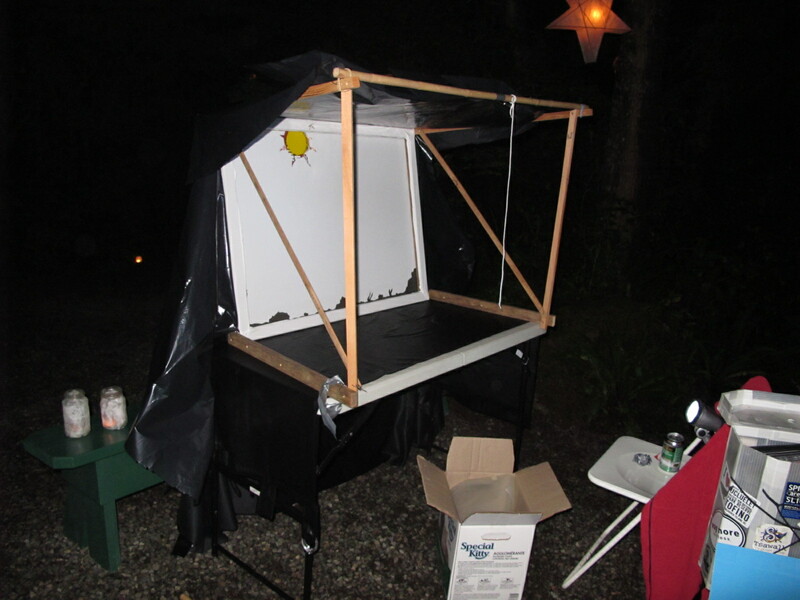 After a crazy-making few days cutting up cereal boxes with an Xacto knife, and piecing together a screen (bedsheet over a wooden frame) and backstage framework, i gave my first shadow puppet show ever at last Sunday’s Lantern Festival at the Tofino Botanical Gardens. It had turned into an entirely last-minute exercise. The previous days of damp overcast and/or pouring rain were not a motivating factor and, wondering whether the whole Lantern Fest might be a washout, i procrastinated right up till the last minute. Backstage with haywire and duct-tape. Fortunately the day was clear, the rain held off, and the event went ahead full steam. With my friend Dolores’s indispensable (and also last-minute) help, we literally haywired and duct-taped the stage and screen together for the first time in fading light, while a hopeful audience of kids stood waiting. Once set up, we adjusted our lights — two bike lights and a flashlight (no power for our outdoor-in-the-woods venue). Then we sat down and, first time for both of us, placed shadow-puppet to screen. The show had begun. Then it hit us: Now what? I had conceived the thing as more or less an animated lantern, a glowing white square with a silent, slowly moving marine scene upon it. 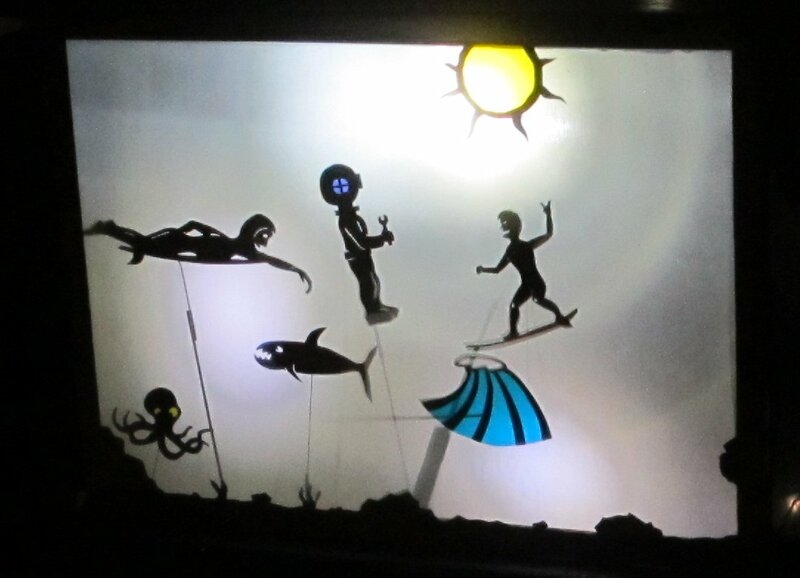 We had at our disposal a deep-sea diver, an octopus, a tuna, a paddling surfer, and a standing surfer (with wave). But once we’d run through the silent routine two or three times, it seemed a little flat. The audience, unbeknownst to us, were at time clustered inches from the screen. Dolores grabbed the initiative at once by having the tuna (now with toothy mouth agape and rebranded a shark) attack the hapless surfer — and a tone was set for the rest of the “performance.” It was all ad lib goofiness after that. Behind the screen we were killing ourselves laughing, whipping the puppets around, with hardly a clue what was going on out front. At one point Dolores peeked around the side of the stage and said, “There’s fifty people out there!” She exaggerated, but i guess something was working. I’m sure a few parents cringed at the impromptu on-screen antics, but from their laughter and comments, the kids clustered in front of the screen were digging it. We “parked” the puppets on-screen later and wandered out front see how it looked: not bad! The lighting was uneven, but for an untested first attempt it was decent. It was interesting to hear the comments from people walking up. “Is that some kind of digital screen?” more than one adult wondered, duped by the decidedly low tech involved. And more than one kid was dragged away complaining that they wanted to stay and to watch the “outdoor TV” (not really the metaphor i was aiming for). Much was learned about shadow puppetry in the course of the experiment. 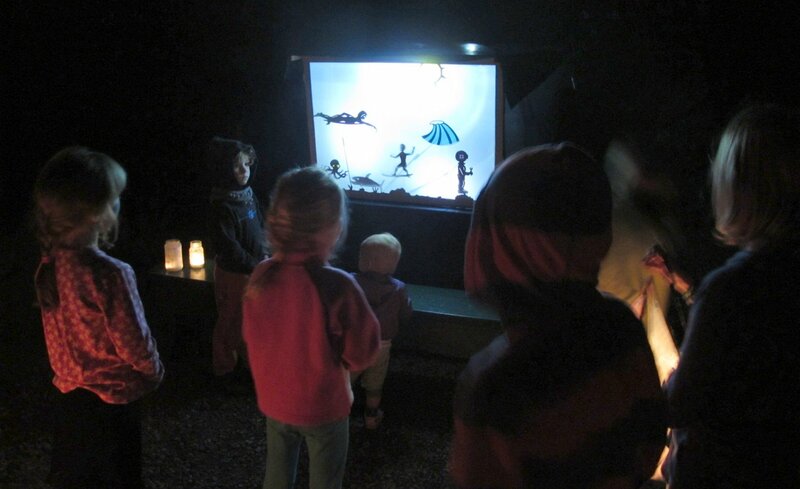 The main lesson: A puppet show demands a story. Years of media habituation, from Sesame Street to The Wire, have forged a subliminal link between characters (however static and rudimentary) on a rectangular screen with the driving need for a plot, for things to happen. We had scant opportunity to create one this time around, but that’s clearly the way to go in future. This entry was posted in theatre and tagged puppets, shadow by greg blee. Bookmark the permalink. Glad to hear you had fun, and from the sounds of it, so did the audience! This is what I was saying about the puppets though – first you work from action, then you figure out the screen and everytihng else. What’s interesti for me is that you basically described what happens when I get contacted to do commisions. People generally don’t have any sense of story and think once they get the puppets everything will just fall in place. You discovered what happens if you don’t focus on story first; the show finishes quickly and you’re left with ‘stuff on the screen’ rather than a puppet performance. Having said that I really commend you for improvising – not being a performer myself I’d be utterly at a loss in that situation. Oh, about the light – normal torches or whatever leave visible circles around the beam (see your second pic). i’ve found a relatively cheap light is a flourescent striplight. If you could fine one that is battery operated, then you’d have an even beam across the whole screen. And the puppets look fab! Love this! I’m really impressed by the artistry of the puppets themselves. And the potential for wicked future “shadowy” storylines is definitely there. Perhaps a new avenue for you? More talent emerging . . . Nice going, and glad you had fun.